The Hebrew word bimah means “platform” and refers to the platform in the center of the synagogue from which the Torah is read. It also refers to the reading table. 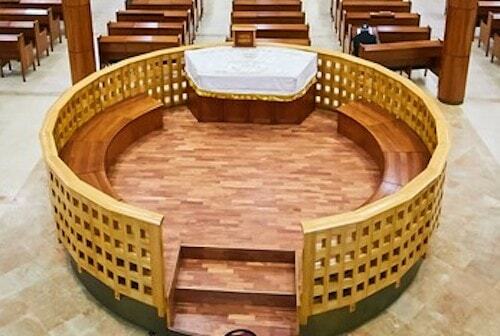 In some (smaller) synagogues, the reading table may be placed directly on floor level with no raised platform at all. It is still called a bimah. The bimah is situated so that the reader faces toward the front of the sanctuary. The table is often draped with a cloth covering to give honor to the Torah that will be read on it. Like a drafting table, the surface of the bimah is slightly slanted, making for easy reading of the (often large) Torah scroll. 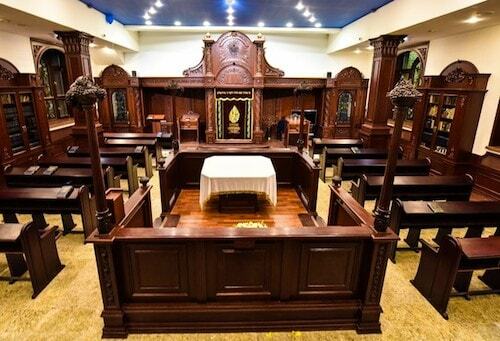 Read: Why Is the Torah Podium in the Center of the Synagogue? During the High Holiday season, the bimah cover, the covers of the Torah scrolls, the cloth covering the amud, and the curtain for the ark are traditionally exchanged for white ones. White represents purity, forgiveness and a clean slate, all central High Holiday themes.